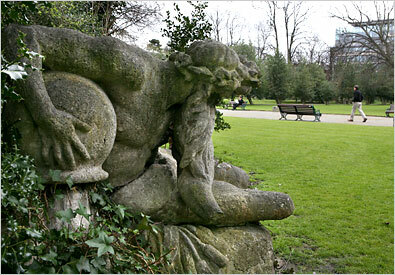 Nerdy Dublin: Dublin’s Secret Garden. If there is an alternative Dublin somewhere out there, populated by faerie and other magical beings, and the odd human who manage to make their way there, an entrance to it surely lies hidden in Iveagh Gardens. This small, quiet park is situated behind the National Concert Hall, with access to it from Lower Hatch Street and Clonmel Street (off Harcourt Street). Despite its central location, it never gets the same kind of hordes of visitors as St Stephen’s Green, or even Merrion Square. Instead, you can enjoy the tranquility as you munch on your lunch on one of the benches or in the lush grass, or just wandering around. Trees and bushes form avenues and paths here and there, inviting you to explore, like Alice, what might lie around the corner. There are disused archery grounds, an artificial waterfall, which still manages to please both eyes and ears, a rose garden, a maze, and a wooded area through which are dotted Classical-style statues, celebrating Artemis and her ilk. While the Gardens have been carefully restored to their original 1860s look, they still clearly have a thick layer of Time coating them, which, together with the quietness in the middle of the city, creates an atmosphere of detachment, of being Elsewhere. 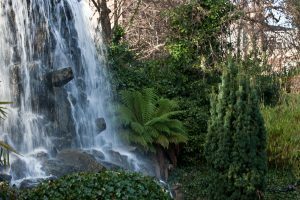 Speaking of time, fans of Doctor Who might find themselves somewhat alarmed on their arrival in the middle of the park – two large stone fountains in the shape of angels face each other with stern expressions across the open area. Just don’t blink! During the summer months, events take place in the gardens now and again, so if it’s peace you’re looking for, you might want to check an events calendar in advance. Concerts, summer theatre and even the city’s major food festival find their way here, with the environment managing to add an extra level of sophistication to the revels.